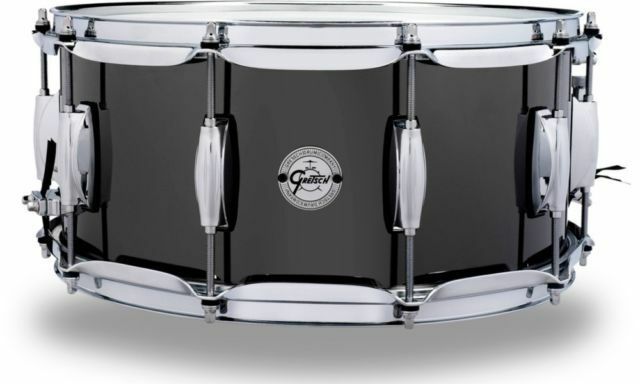 Gretsch’s black nickel over steel snare drum falls within its Full Range line. The drum’s steel shell has 45’ bearing edges and comes with 2.3mm triple flanged hoops, 10 double ended lugs, 20-strand snare wires and Remo heads, the batter head being a CS reverse dot. The drum has a wide tuning range and to me, sounded particularly good at a medium and lower tensioning, although possibly a little choked when cranked up. In fact, whilst editing the video, I was completely surprised at the low end and power coming through the speakers at me at the lowest tensioning I’d tried. I don’t normally go that low with a snare drum but in this instance, I was very glad I did. It reminded me of the Def Leppard Pyromania snare sound, except without it being a sample. I knew when I took the drum out of its box that it was a budget model. It has some features which you will find on higher value drums, but for the price, which I only now looked up when writing this, I’m genuinely impressed with the drum. It is a good size, the tuning range is wide, so you can take it up or down, and it would probably make a nice general purpose or gigging drum. Plus, the black nickel finish makes it look pretty cool too.